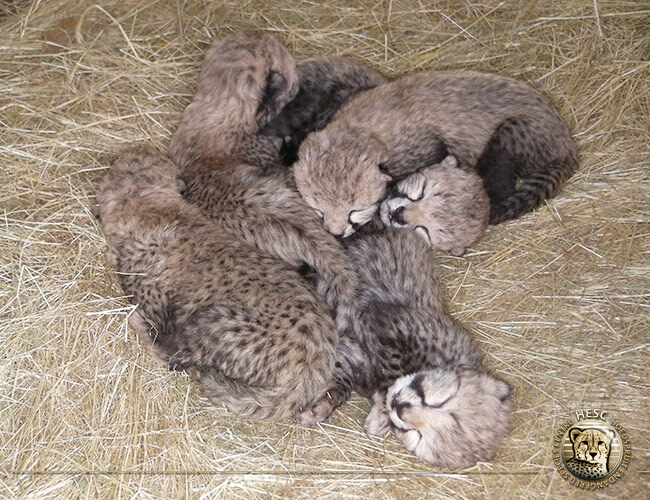 On the 17 April 2015, Salome gave birth to five tiny cheetah cubs at Hoedspruit Endangered Species Centre’s (HESC) maternity ward. The five babies were in the typical cheetah gestation period of between 90 – 95 days (hers was exactly on the 93rd day). Salome was moved to the maternity ward on the 23rd of March 2015. This facility makes it easier to monitor a pregnant female’s movements, and is also warmer and provides better shelter once the babies are born. It is secluded, and neither vehicles nor people are permitted in the vicinity. At this point, the staff at HESC will not approach the cubs so as not to interrupt the very natural process of mother-to-infant care. However, as monitoring is a very important part of conservation, a 24/7 webcam with live video and sound has been set up in collaboration with the team at Africam.com. Through this device they can monitor the cheetahs, as well as gather valuable information for future conservation efforts. For the HESC, educating about and promoting awareness of the cheetah is paramount. To this end, they have made the webcam available to the rest of the world. Viewers can check in with the cheetah family at any time to see how the babies are doing, and if they would like to help in the conservation effort, there is a donation portal through which they can contribute directly to the care of the cubs. Tom & Sheila were the parents of Salome, who was born on the 17 April 2008. Salome was born in Lente Roode’s home. After her mother Sheila, broke her hind leg just before delivering a litter. Sheilah was handraised, which made it possible for Lente Roode to act as a mid wife during the delivery. With her hind leg in a cast, she was unable to reach and clean up her cubs after the delivery process, and Lente Roode handed the cubs one by one to Sheilah to complete the delivery process. That was the day of arrival for Salome. Sheilah was a great example for Salome to be one of the greatest mothers in the animal kingdom. Lex was born to Selati & Tanya on the 24 July 2007. 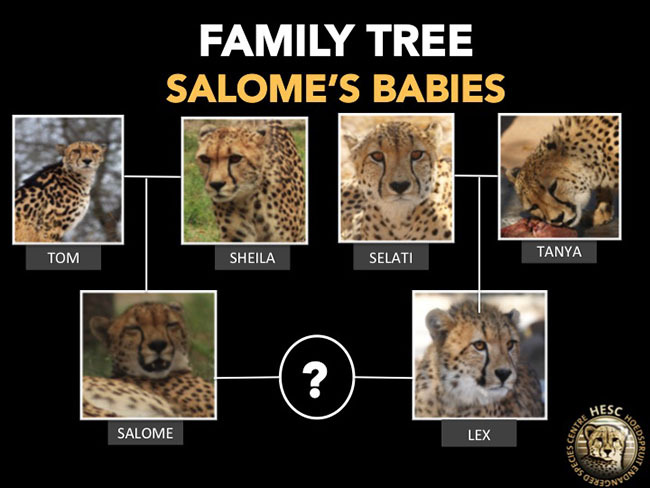 The HESC is focused on the breeding of cheetahs, including the king cheetah, in order to broaden the cheetah’s genetic pool with a view to introducing the vulnerable animal in areas where they are not typically found. According to the Red Data book, the cheetah is currently listed as “vulnerable” in South Africa. This is an improved categorization when compared to the previous global listing of the species as ‘endangered’. This is, in part, thanks to the various breeding initiatives that have been undertaken by conservation bodies similar to The HESC. Cheetah populations are genetically very uniform (or monomorphic). Wild cheetahs often occur in small isolated or patch populations, which leads to further narrowing of the gene pool. Through their breeding programme, The HESC is able to stimulate distinctly different genetic lineages to maintain a healthy ex situ reserve of animals. Wherever possible, these animals are released into a natural environment to support gene diversity in wild populations. And while all the excitement happened… Tia gave birth next door too! Tia delivered 4 tiny baby cheetah cubs (also on the 17 April 2015) on the 94th day of her gestation period. Tia was born to Tom & Tinga on the 07 April 2008. Martin was bought to the Centre (SPCA Phalaborwa bought him here) on the 08 December 2007 (of which his actual birthday has not been confirmed as well as who his parents were). We unfortunately do not have an Africam in her maternity ward as one was rather installed in Salome’s (again) due to her ease in her previous litter. We will continue to keep you updated via our Facebook page, and future blog posts. Watch this space.